Place the Supply Board in the center of the playing area. It is used to store the Green Areas, Animal Houses, and Enclosures. 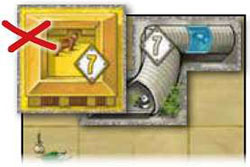 Stack the Green Areas on the designated spaces: use all Toilets and Playgrounds; only use four Food Streets and four Rivers per player-leave the rest in the game box. 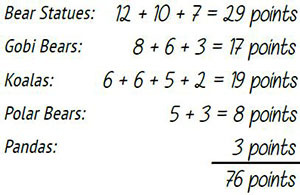 You can find the exact numbers on the Supply Board and in the following table. Select the appropriate Animal Houses. The number of players defines the values used; this information is printed on the Supply Board as well as in the following table. Leave the rest in the game box. (The values are shown on the tiles in a diamond with a white background color). Stack the tiles based on their shape on the designated spaces and sort them by number in each pile, from lowest (bottom) to highest (top). Example: In a two-player game, each pile has 6-4-2 (from top to bottom). 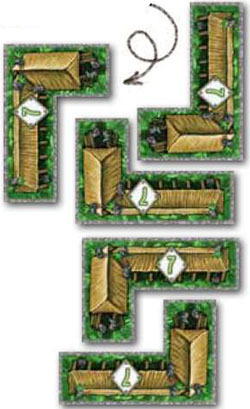 Place the Enclosures on the designated spaces-always use all tiles, regardless of the number of players. Lay out the Bear Statues next to the game board, in numerical order. 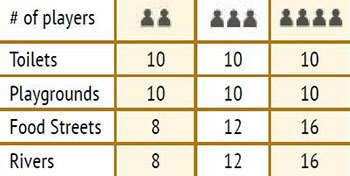 The number of players defines the values used (see table). Leave the rest in the game box. (The values are shown on the tiles in an octagon with a golden background color). Shuffle the 12 Park Areas without an Entrance and place them in two piles of six tiles each within reach of all players. Only the top Park Area in each pile should be visible. Each player gets a random Park Area with an Entrance. Place it in front of you so that the Entrance is closest to you and the icons are in the correct orientation from your point of view. This is your park that you are going to develop. (The different nationalities displayed on the Entrances have no effect on gameplay). The starting player is the player who last visited an animal park. Alternatively, determine a starting player at random. The starting player gets a Toilet, the second gets a Playground, (if applicable) the third player gets a Playground, and the fourth player a Food Street. 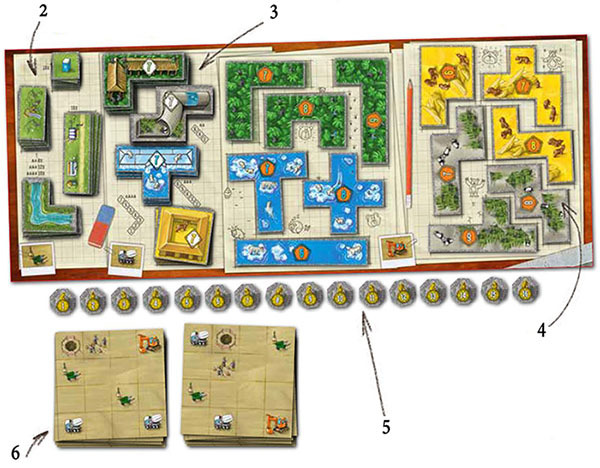 In a - three-player game, the third player gets a Food Street (instead of the Playground). Place the tile you get in front / of you-this is your supply. You may not cover the Pit (with tape all around). The tile may not overlap another tile. You may rotate and/or flip the tile as you wish. The tile must be orthogonally adjacent (not diagonal) to another previously placed tile. 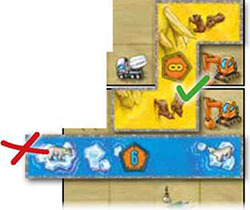 Only the first tile you place in the game may be placed anywhere in your park, so long as it observes the other placement rules. Next you must evaluate the icons you covered with the newly placed tile. If you cover more than one icon, carry them all out in any order. Most icons provide new tiles. There is no limit to the number of tiles you may have in your supply. Take a Green Area of your choice (Toilet, Playground, Food Street, River) from the Supply Board and place it in your supply. If a pile runs out of tiles, you cannot take any more of those. 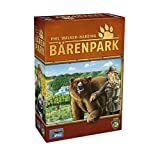 Take the top Animal House from a pile of your choice on the Supply Board (Polar Bears, Gobi Bears, Koalas, or Pandas) and place it in your supply. Alternatively, you may take a Green Area of your choice instead. If a pile runs out of tiles, you cannot take any more of those. The white symbols on the Animal Houses indicate how many points you get for them. Take an Enclosure of your choice from the Supply Board and place it in your supply. Alternatively, you may take a Green Area or Animal House of your choice instead. The orange symbols on the Enclosures also indicate how many points you get for them. You must place the new Park Area orthogonally adjacent to another Park Area in your park, so that their edges fully align to one another. 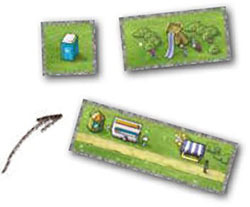 All icons on the Park Area must be in the correct orientation from your point of view (i.e. with the bottom of the icon pointing towards you). You may not place the board below the Entrance-in other words, it may not be closer to you on the table than the Entrance to your park. Important: A player may only own a maximum of four Park Areas. So, if you cover your fourth construction crew during the game, you do not get another Park Area! Finally, check whether you completed a Park Area (with or without Entrance), i.e. if you covered all spaces (except the Pit) with tiles. If you did, take the Bear Statue tile with the highest value from the supply and place it on the Pit of the just-completed Park Area. If you complete multiple Park Areas in one turn, you may take one Bear Statue for each newly-completed area. When it is your turn and you have no tile in your supply that you could place in your park, you must pass. Take a free Green Area of your choice (Toilet, Playground, Food Street, River) from the Supply Board and place it in your supply. Your turn ends immediately. You can only place the free tile on your next turn. You may not pass if you can place a tile. 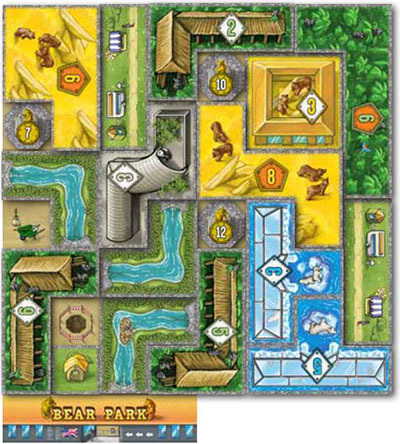 When a player completes all of their four Park Areas, each other player gets one more turn. After that, the game ends and you score your parks. 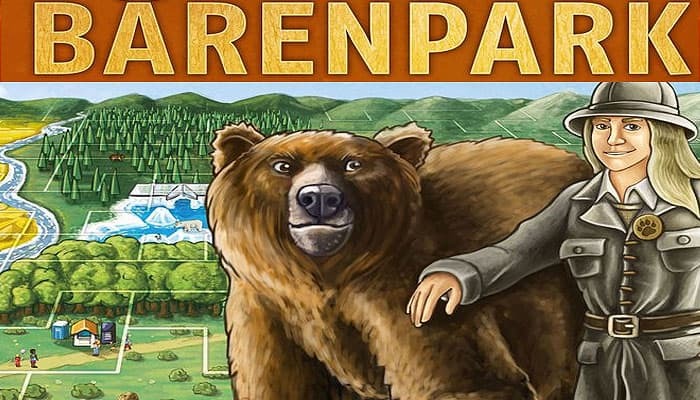 To do so, add up all the values on tiles in your park (including Bear Statues). Example: The depicted park (which has not been finished in time) is worth 76 points. The player with the most points wins. In case of a tie, the tied players total the point values on the tiles left in their supply (which they did not place)-the highest-value total breaks the tie. If still tied, there are multiple winners. We recommend experienced players include Achievements in their games; these provide additional points if you meet their requirements. Setup: Choose three of the ten types of Achievements (at random or by agreement). For starters, we recommend "Polar Bears", "Green Areas", and "Animal Houses". There are three copies of each Achievement with different point values. 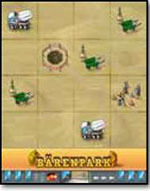 Place the three tiles of the chosen types in separate piles in view of all players. Sort the tiles in each pile by number, with the highest value being on top. In a two-player game, remove the Achievement with the lowest value from each pile. If you meet the requirements of one or more Achievements, claim the top tile from the appropriate pile and place it in front of you. You may claim at most one tile of each type, even if you meet the requirements multiple times. At the end of the game, add the values of the Achievements you claimed to your total score. There are three tiles with polar bears in your park (regardless of size). These tiles need not be adjacent to one another. There are three tiles with Gobi bears in your park (regardless of size). These tiles need not be adjacent to one another. There are three tiles with koalas in your park (regardless of size). These tiles need not be adjacent to one another. There are three tiles with pandas in your park (regardless of size). These tiles need not be adjacent to one another. There is a cluster of six Green Areas in your park (Toilets, Playgrounds, Food Streets, Rivers). Each tile in the cluster must be orthogonally adjacent to another tile in the cluster (not diagonal). There is a (horizontal or vertical) line of three contiguous Food Streets in your park. There are three River tiles in your park forming an uninterrupted watercourse across these tiles. All three Enclosures in your park form a cluster, i.e. each Enclosure is orthogonally adjacent to at least one other Enclosure (not diagonal). There is at least one each of the four different shapes of Animal Houses in your park. These tiles need not be adjacent to one another. You have placed two (or more) Bear Statues in a single turn on the Pits of newly completed Park Areas. On your last turn in the game, you may ignore the Pits and cover them with tiles, if you like. However, you do not get a Bear Statue for a completed Park Area if you covered its Pit.